olly, the girl in the photo above, has a motto. I’m not sure whether she had time to think about her words or whether she just uttered them on the spur of the moment. It’s a phrase that resonates. I first heard it when she was sparring. We’d sprinkle the moments between matches with liberal amounts of push ups and sit ups, just to see if any of the six or seven year olds would give up. None of them did. When the time came to grapple, she walked across the mats and picked the biggest kid in the class, a much older Brown Belt. Fight after fight, she her eyes always settled on the toughest, biggest kids, girl or boy. And there was no giving up for her. Never. 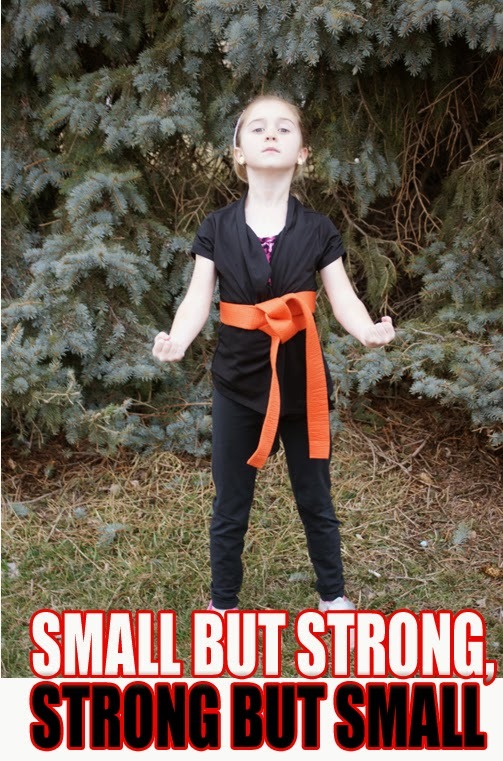 “I’m small but strong, strong but small!” she said. It became her motto. And the motto of the class. So I invited her down to an evening Kung Fu class to see how this little fighter would handle the complex aggression that engines the Hsing I and My Jong systems. She beat me to class. When I arrived, she was already on the floor with the others with twenty minutes to spare. Everyone was doing her or his usual stretches; she was going through a batch of Yoga, gymnastics and martial arts stretches, along with plenty of strength exercises. The adults – and the rest were all adults – had no warning that she would make an appearance. They obviously reckoned that she had been invited. But they kept staring at this little self-motivator, some with their jaws hanging loose at the hinges. Sometimes, as an instructor, I wonder what was I doing at that age? Did I have a motto other than “it’s better to have two scoops of ice cream rather than one?” And, if I had a motto like hers, would I have been capable at her age of acting on that motto? Right now, she’s gearing up for a test in three weeks. If I know her, she’ll probably want to fight every member of the class. And if I ask her to, she’ll honour us with her motto afterward. Just a brief explanation about where her uniform disappeared to. We’ve been trying to shoot the photo for over a month now. Her dad and I finally coordinated after the class, after she had already changed. But she did still have her belt out. With a young person like her, it doesn’t really matter whether the belt is physically on or off. Holly wears it in her self, wherever she goes.